I’ve added this cute little Cream Puffs Recipe that is all dressed up for the holidays with a delicious Cranberry Orange Sauce and dusted with a layer of powdered sugar “snow” to this year’s Christmas Week Event. 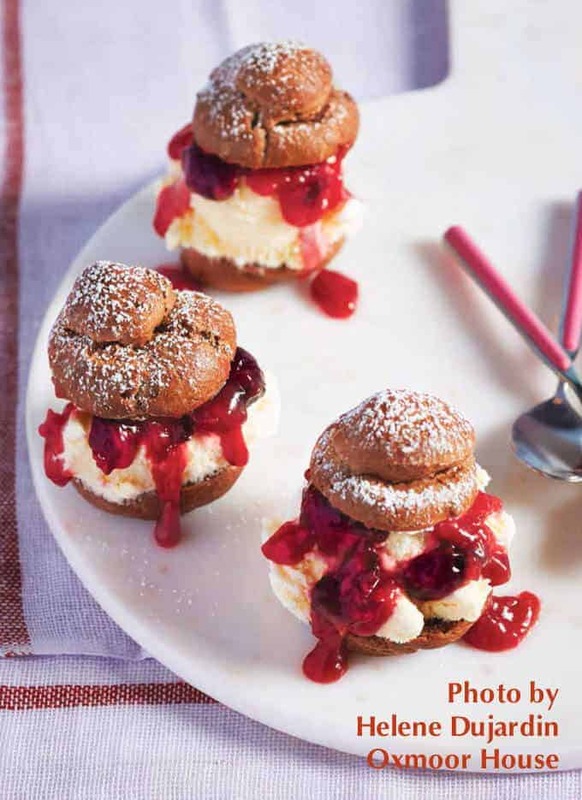 When you are looking for something a little fancy for your holiday table and gingerbread cookies or Grandma’s famous fruit cake just doesn’t fit the bill, try these adorable little cream puffs from my good friend Barbara Schieving’s brand new book, Simply Sweet Dream Puffs: Shockingly Easy Fun-Filled Treats. Barbara is the genius behind the popular blog, Barbara Bakes and Pressure Cooking Today so you know this cream puff recipe will taste amazing and turn out right every time. I was thrilled when Barbara asked me to take a look at her new book see if these is a recipe or two that I might like to share with Everyday Southwest fans. My only problem was that the book is filled with so many delicious and creative recipes that I had a hard time choosing just one! She has Root Beer Profiteroles, Pecan Pie Eclairs, Bananas Foster Cream Puffs and so many mouthwatering treats. I mean really… we are talking RED VELVET people! Have you ever heard of a Red Velvet Eclair?! With so many Cream Puffs to choose from, I decided to let the Holiday Season make up my mind for me and chose Barbara’s delicious Black Cherry Profiteroles Recipe. I did change her sauce a tiny bit by adding cranberries to the recipe ( I don’t think she will mind very much) that way, I could add her Cream Puffs Recipe to this year’s Christmas Week event. What! You haven’t heard of Christmas Week? Christmas Week is an annual event that is hosted by Kim. The blogger. The photographer. The horse fan extraordinaire (not to mention creator of the totally off the hook food blog Cravings of a Lunatic) back in 2012 and it has been going strong ever since! This year, she has corralled over 35 bloggers to share their favorite Holiday Treats in a week long Holiday-a-Polooza of recipes and a giant Amazon Gift Card Giveaway! This year, we have rounded up our resources and are giving away THREE Amazon Gift Cards. We will close three different winners (one for each prize) for 1 x $250 Amazon Gift Card, 1 x $50 Amazon Gift Card and the Grand Prize of 1 x $800 Amazon Gift Card. That’s $800 in prizes for Christmas Week. The Giveaway will run from December 7th to December 26, 2015. The three winners will be notified by email and will have 72 hours to respond before a new winner is chosen. To enter, just scroll to the bottom of this post (below the Cream Puffs Recipe) and use the Rafflecopter to enter. Don’t worry, the only thing you need to do to enter is to leave a comment (using the Rafflecopter) on this post. HOWEVER, if you LOVE giveaways like I do… and want to have more than one entry… you can use the Rafflecopter to enter as many times as you would like by following Everyday Southwest and the other amazing blogs on social media. GOOD LUCK! I would love to see one of our Southwest fans win! Now back to Barbara’s Cream Puffs! You won’t believe how easy cream puffs are to make. I know, I know, the “baker types” try to make it sound mysterious and super secret in order to impress everyone they meet. BUT, the real truth is, they are actually very easy, require NO guessing about yeast, NO fighting for flakiness, and NO kneading for hours! Barbara has shared her step by step tips for making them so, if this is your first time OR you haven’t made them in a long time, you won’t be alone! Here is the link to Barbara’s Step by Step Photos of how to make PÂTE Á CHOUX or Cream Puff dough. Here is the link to her easy to follow video. Here is Barbara’s amazing recipe using her basic pate a choux dough. The dough pictured in the top photo is actually her chocolate pate a choux that is feature in her cookbook. follow this link to download Simply Sweet Dream Puffs on kindle. Here is her recipe as I made it. For Cranberry Sauce: In a sauce pan, whisk together ½ cup granulated sugar, the cornstarch, and a pinch of salt. Stir in cranberries and fresh orange juice, Bring to a boil over medium heat while stirring constantly. Reduce heat and simmer 2 minutes or until sauce thickens and cranberries begin to pop. Remove from heat and stir 1 tablespoon butter and orange zest. Chill. For Cream Puffs: Preheat oven to 425 degrees. Lightly grease or line baking pans with parchment paper. Measure the flour and set aside. Bring butter, sugar, salt and ¾ cup water to a boil in a large sauce pan over medium high heat stirring occasionally. Immediately remove from the heat and quickly stir in flour all at once. 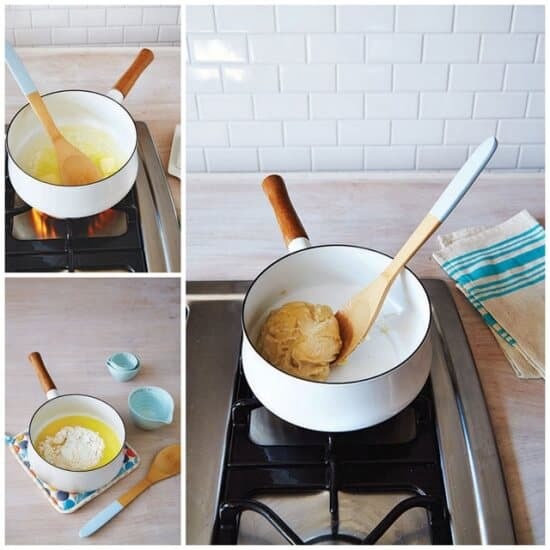 Return to heat and stir with a wooden spoon for 1 to 2 minutes, or until dough is smooth and forms a ball. Transfers the dough to the bowl of an electric mixer and cool for 5 minutes. Add 3 eggs one at a time, beating until mixture is smoothened glossy. Spoon dough into a pastry bag fitted with a pastry tip. Pipe dough onto prepared pans in 1½ inch round circles that are 1½ inch high. Smooth out peaks and round tops with a moistened finger. Whisk together remaining 1 egg and 1 teaspoon water. Brush tops of dough with egg mixture. Bake at 425 degrees for 5 minutes; reduce oven temperature to 375 degrees and bake 30 minutes or until puffy and golden brown. Turn oven off and let shells stand in closed oven for 10 minutes. Remove from baking sheets to wire racks and cool completely. To Assemble: Cut cream puff shells in half crosswise. Spoon in some of the Cranberry Orange Sauce then place a scoop of ice cream or pipe stabilized whipped cream on top of the sauce and more sauce on top of the ice cream. Replace the top of the cream puff and dust with powdered sugar. If using ice cream, serve immediately. I know that there is a lot going on in this post—an amazing Cream Puff Recipe PLUS a great giveaway Plus links to all of the other Bloggers that make Christmas Week so special. So, if you have any questions at all, please, please, please get a hold of me to ask me. You can always reach me very quickly on The Everyday Southwest Facebook Fan Page OR leave me a comment on this post. And, of course, you can always email me at everydaysouthwest (at) yahoo (dot) com. « Easy Holiday Cream Cheese Cookie Recipe PLUS a Huge Amazon Gift Card Giveaway! We all bake pies at my mom’s house. My favorite is the chocolate chip pecan pie. It must have a million calories, but is so good. I like to make a pumpkin cheesecake. It is a highly requested treat, and so easy to make! I love how you changed up the profiteroles for the season. Such a great idea. Thanks for the wonderful review of my cookbook. I’m so glad you loved it. What a fabulous giveaway! MY favorite treats to make are Christmas Wreath Treats and Rum Balls! My favorite thing to make during the holiday season is fudge. I love all the different kinds of Christmas cookies. It’s so fun to try new ones, too. My favorite sweet treat to make for the holidays is magic cookies bars! I love to make Hot Buttered Rums, so rich and delicious. I love making Peanut Butter Kiss cookies for Christmas. I love making Gingerbread Cookies with my kids. Cream puffs are my fave! Will definitely be giving this recipe a go! My aren’t these lovely treats! Definitely pinning. It’s been ages since I made any kind of puff but they make such an entrance. You had me at cream puffs! I love them. I’m also going to enter the rafflecopter. Thanks! What?! This is blowing my mind! It looks delicious. Oh I love anything orange cranberry!! I bet these are amazing!!!!!!!!! Minimize the perimeters from the stays of the small milk carton. 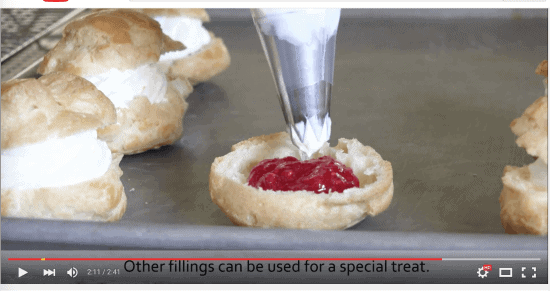 I have not tried a cream puff, but I appreciate Barbara’s video to help me learn how to make it. I’m a visual learner and always appreciate the images, still or moving. I imagine once you get the basics down–and that includes pronunciation–it becomes simple to do. Cream puffs are so fancy looking, yet soooo simple to make. I love how you changed them up to look so amazingly festive!! The cranberry and “snow” here look gorgeous!! What a great way to change up cream puffs. I love the cranberry orange sauce and think these would make a fabulous treat for Valentine’s Day. After all, why should Santa have all the fun:)? I love cream puffs and eclairs. These are so pretty! Those cream puffs truly do look dreamy! I think the cranberry was a great adjustment for the holiday. 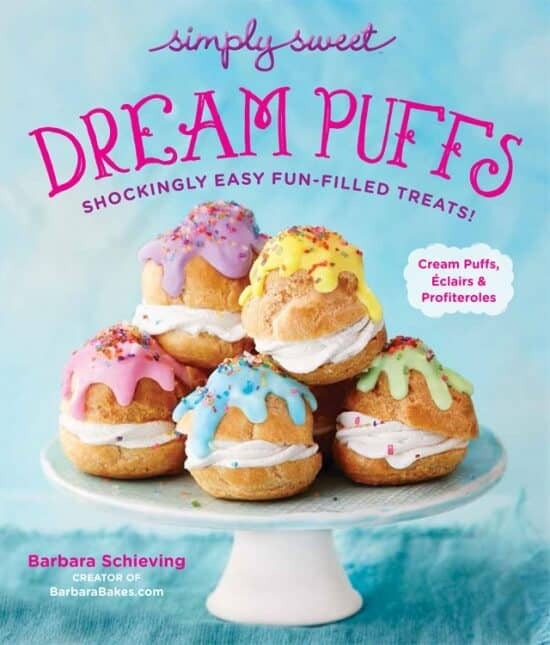 I love cream puffs and the ones featured on the cover of Barbara’s book looks absolutely delicious. I bet that cranberry-orange sauce really makes this dessert over the top yummy. These cream puffs sound delicious. I would imagine it would be easy to change out the fruit and make it with just about any but the cranberry-orange sounds really good and would make a great holiday treat. Pinning the recipe, thanks! This sauce was incredibly luscious! It was the perfect balance of sweet and tart! These beautiful cream puffs were heavenly! I was pleasantly surprised that this recipe was super easy to make. 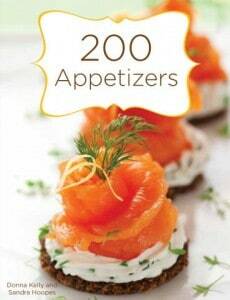 This is the perfect recipe for dinner parties, Valentine’s Day and Mother’s Day. I recommend making a double batch! The sauce was amazing and the cream puffs were super easy to make. I’m making them again this week for Valentine’s Day.